As one of South America’s most vibrant and lively capital cities, Buenos Aires is full of ambience with late-night tango dance halls, raucous steakhouses and buzzing wine bars. With so much character packed into this hedonistic metropolis, it can be difficult dividing your time in the city. Gastronomy, football and dancing are some of the city’s main attractions, but you will also find delight in wandering around some of Buenos Aires’most distinctive neighbourhoods. From trying parrilla to visiting one of Argentina’s most famous gravestones, these are the six things you should be ticking off on your Buenos Aires bucket list. Brimming full of art galleries, late night wine bars and traditional steakhouses, you can’t visit Buenos Aires without exploring this bohemian neighbourhood. Every Sunday, a bustling flea market runs from 10am to 4pm, running through Calle Defensa to Parque Lezama. Mercado de San Telmo started in 1897, to cater for the growing number of immigrants arriving from Europe. Since then, the stalls have been updated however you can still find everything from antiques to fresh fruit and spices. In the evening, grab una copa de vino roja from the nearby bar and head to Plaza Dorrego, a small square lit up by fairy lights, where you can watch local tango dancers performing one of South America’s most sultry and seductive ballroom dances. Anyone from seasoned pros to first timers can have a go, and the music player in the background makes you feel like you’ve been transported back to the 1920s. As the birthplace of tango, you can’t leave Buenos Aires without watching at least some. When you tell people, “you can’t leave the city without visiting the cemetery,” you’re bound to get some funny looks. However, the barrio was once home to Buenos Aires’ rich and powerful is now a beautiful and affluent neighbourhood which is worth walking around. The cemetery itself is a well-known landmark and the final resting place of many of Buenos Aires’ well-to-do including presidents, Nobel Prize winners and celebrities. In the famous graveyard you’ll find ostentatious tombstones and crypts towering above you, as Buenos Aires’ former rich and famous trying to out-do each other – the more exuberant the tombstone, the richer the deceased. Visit Eva Peron’s grave, the first lady of Argentina and actress who inspired the women’s suffrage and fought to improve the lives of Argentina’s impoverished. You can’t miss it: there is always a fresh bunch of flowers and small gathering taking photos of her grave. Behind neighbouring Uruguay, Argentinians eat the second most amounts of beef in the world (57 kilos per person) and so for this carnivorous country, eating steak is no laughing matter and something you should not leave Argentina without trying. Buenos Aires is littered with raucous steak houses to try this meaty treat. The best are in San Telmo (Gran Parrilla del Plata) and Palermo (Don Julio and La Cabrera). You can’t leave Buenos Aires without visiting this popular tourist attraction. The colourful neighbourhood of La Boca is usually the poster child of Buenos Aires. Brightly painted zinc shacks are evocative of the barrio’s early immigrant days. The main street, El Caminito is full of noise and colourful: art vendors, tango dancers and buskers all join together to give this neighbourhood the lively ambience it is famous for. Home to football club, La Bombonera, match days can mean the district is especially noisy, with the incessant clamour of football chants and vuvuzelas (you know how seriously Argentinians take their football). It is advised to leave when the sun sets however, as the neighbourhood has a reputation for being seedy after dark. 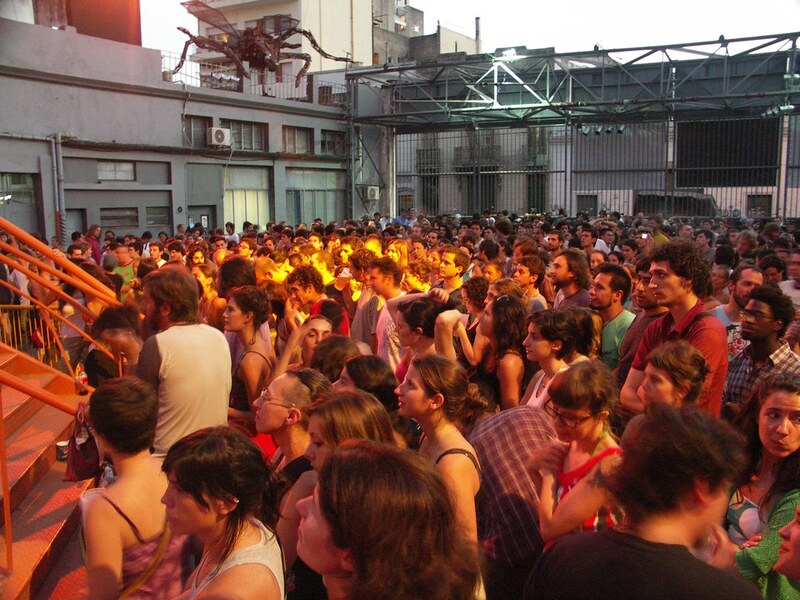 Not knowing what to expect, I arrived at the Konex Cultural Centre in the Abasto Neighbourhood where a crowd of excited Argentinians was gathering. When the lights went down and the show started, the crowd went wild for the 17-piece improvisational drum group who came out on stage, and gave us two hours of lively drum beats and maracas. Staying within the city’s limits could fool you into thinking that Buenos Aires is a wealthy and affluent city – and some bits of it definitely are. However, you don’t need to look too far to see that poverty and deprivation exists. The neighbourhood Retiro, where the city’s main bus station lies, is one of the city’s wealthiest districts. However, it lies next to Villa 31, a barrio full of ramshackle makeshift houses with tin roofs. In fact, Buenos Aires is a tale of two cities – wealth and prosperity sits alongside poverty and crime and 20 per cent of the city’s residents live below the poverty line. Doing a bit of research, I came across Fundacion Banco de Alimentos, a food bank in the suburbs of San Martín, which may just be a drop in the ocean, but is trying to eliminate hunger in the city. Canned and processed foods are collected and sorted in a warehouse and as a volunteer my job was to check expiration dates, separate products and prepare bags and boxes for delivery. Volunteers and employees are extremely friendly and were keen to help me improve my Spanish skills. This is a perfect opportunity for anyone looking to enrich their time in the city and want to get to know it properly.